The Pantawid Pamilyang Pilipino Program (Pantawid) is a human development program of the Philippine national government which is implemented through the Department of Social Welfare and Development (DSWD). The program has been regarded as one of the Philippine government’s vehicles through which its commitment to poverty reduction is concretized. 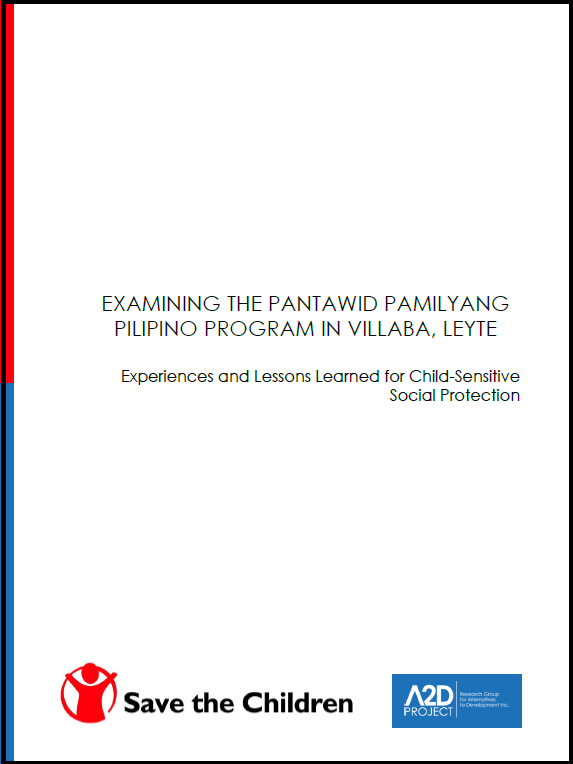 This report presents the findings of the study conducted by A2D Project for Save the Children Philippines which aimed to generate deeper understanding of the strengths and weaknesses of the Pantawid program as well as identify opportunities for promoting child-sensitive social protection in the town of Villaba, Leyte. 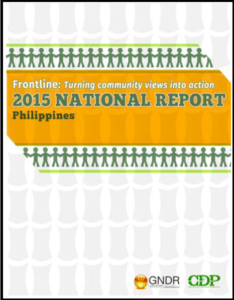 As part of the Frontline program initiated by the Global Network of Civil Society Organizations for Disaster Reduction (GNDR), this report showcases the results of a participatory action research conducted in selected areas in the Philippines representing a varied range of risk zones. The program sought to elicit views of local communities regarding the everyday risks that they face, their consequences, and most importantly how local communities can find solutions to address these risks. 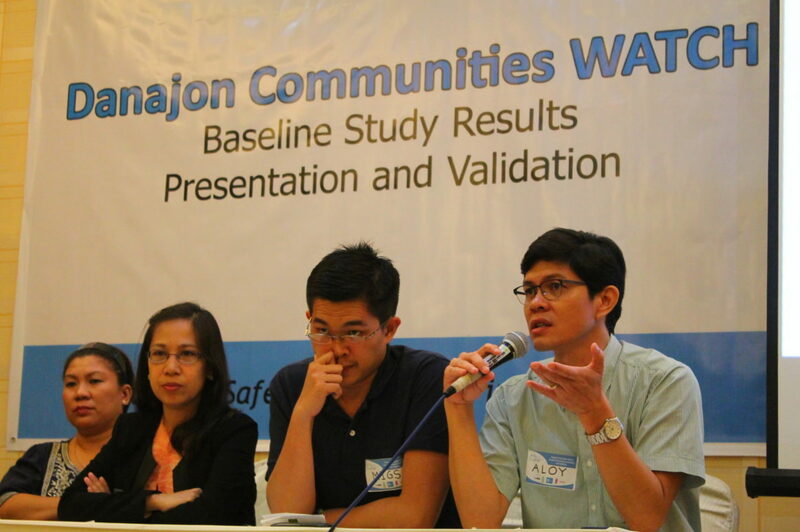 In close partnership with the Center for Disaster Preparedness, A2D Project led the conduct of research activities in the Municipality of Tabogon, Cebu, one of the areas featured in the report. As disability is now increasingly being recognized as an important consideration in reducing disaster risks, pioneering initiatives to create disability inclusive disaster management and risk reduction programs are currently being developed, implemented, and advocated for. 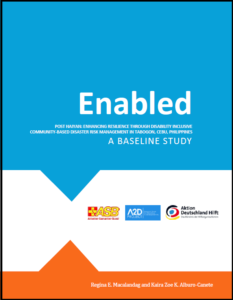 In line with this, A2D Project conceptualized and implemented the ENABLED Project, a community-based initiative aimed towards mainstreaming disability inclusion in local disaster risk reduction processes applying the Purok System. This report presents the findings of the baseline study conducted to aid the direction of project implementation. 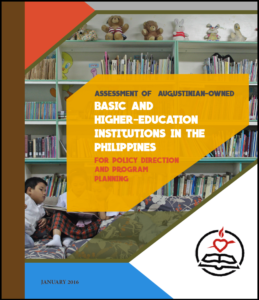 This research was done in behalf of the Commission on Education on the Augustinian Province of Sto. Niño de Cebu to inform its engagements and services in basic and higher education as an essential pastoral activity of the Augustinians. The assessment gathered evidence on the performance status of the University of San Agustin in Iloilo City, Colegio San Agustin in Bacolod City, Colegio del Sto. Niño in Cebu City, Colegio San Agustin in Mati City, and Colegio San Agustin in Biñan City against education reforms in the Philippines in particular, and in the ASEAN region in general. 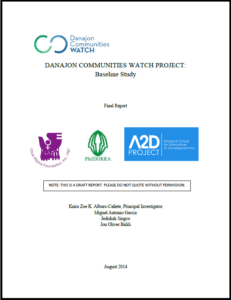 The Danajon Communities WATCH Project, is a three-year project funded by Caritas Switzerland and the JTI Foundation. It is designed with the end goal of enhancing the resilience of vulnerable and impoverished communities on and around the Danajon Bank, situated in Central Philippines, to disasters as a strategy for preventing human trafficking. This report contains the findings of the baseline study with the objective of understanding the conditions that amplify the risks to human trafficking in times of disasters and to inform the conduct of monitoring and evaluation activities throughout the project life. Hence, this research not only aimed to demonstrate the connection between human trafficking and disasters, but also and more importantly, to contribute to developing strategies for prevention and protection. 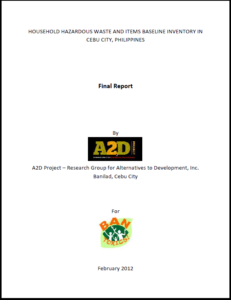 This research project was carried out in response to concerns regarding the generation of household hazardous wastes in Cebu City. In partnership with the Cebu City Government and Ban Toxics!, A2D Project conducted this Household Hazardous Wastes and Items Baseline inventory in order to collect information on how households generate hazardous wastes, and on the levels of awareness and actual practices in relation to storage and/or disposal of hazardous materials, especially those that contain mercury. The overall goal of the study was to produce recommendations for policies related to managing household hazardous wastes. Motivated by their desire to organize and strengthen informal community-based monitoring mechanisms and capacity building of stakeholders for child protection in Cebu City, The Share a Child Movement, Inc. (TSACMI) contracted A2D Project to conduct a rapid assessment to generate baseline information on the condition of children in the eight (8) target barangays situated in the cities of Cebu, Mandaue and the municipality of Consolacion. 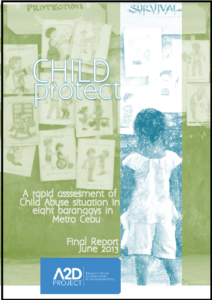 This report presents the findings of the rapid assessment, specifically outlining the main forms, factors, and risks that shape child abuse situation in TSACMI’s partner communities. 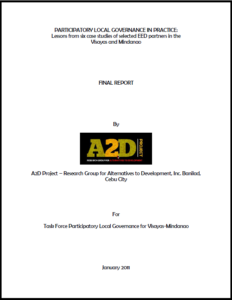 A2D Project was contracted by the Task Force-Participatory Local Governance (PLG) Visayas and Mindanao, a network of non-government organizations (NGOs), to conduct a study on how to enhance participatory local governance practices among selected EED partner-NGOs in the Visayas and Mindanao. EED is a German acronym for an organization of Protestant Churches based in Germany that has provided Task Force-PLG a grant to undertake this research. This report presents the findings of the study and provides recommendations for enhancing participation in local governance.